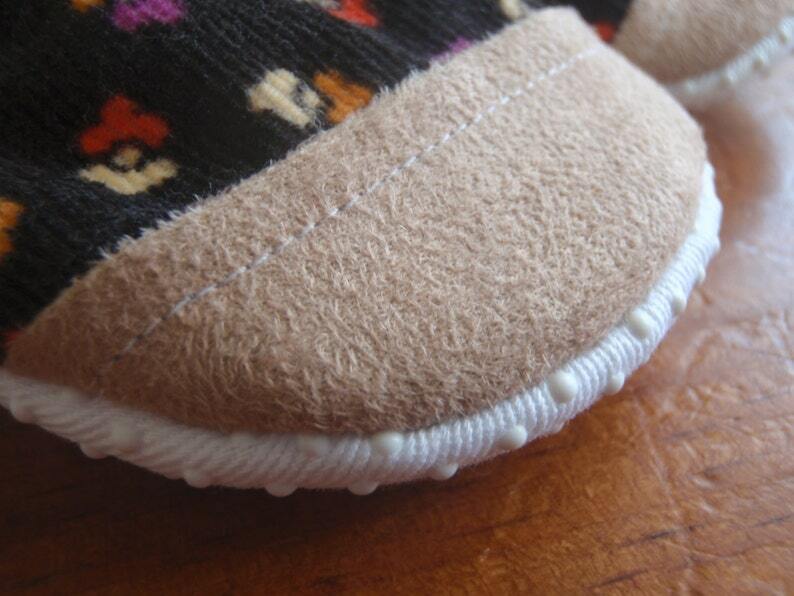 If you are buying a pair of booties for a child that is beginning to crawl, you may want to add-on a reinforced toe. This will protect the front edge of the shoes from any wear and tear, as you will soon understand that a crawling child equals feet dragging along the floor ALL day! Photos 1-4 show shoes with a matching fabric used for the sole and reinforced toe, while the last picture shows a mismatch of faux-suede & non-slip fabric. Whichever fabric selection you choose above will be your choice for the reinforced toe only. The actual shoes that you purchase will have it's own option to choose a fabric for the sole. Still useful for a running and walking (and a little bit crawling) child! Still useful for a walking (and a little bit crawling) child! just great for a moving baby!